US Cellular has started rolling out Android 4.4.2 KitKat to both the Galaxy S4 and the Note 3. 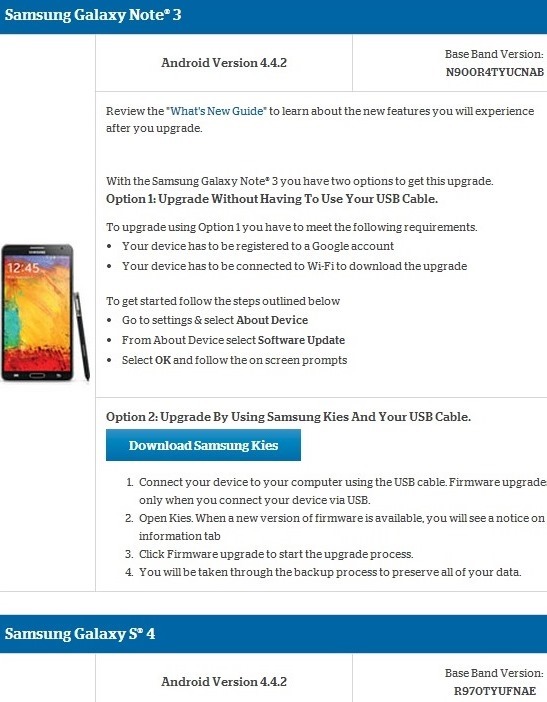 You can either get the OTA update, or connect your device via USB and download the update manually using Samsung Kies. As always, you should be on the latest software build to be eligible to receive the update, so go to your device settings and ensure that you’re on the latest build. The baseband version for the Android 4.4.2 KitKat build for the Galaxy S4 is N900R4TYUCNAB and R970TYUFNAE for the Note 3. As always all users will not receive the update at the same time. US Cellular mentions that making the Android 4.4.2 update includes a new user interface in addition to all the features that are introduced by Google. They include a new phone dialer, Hangouts SMS integration, wireless print integration, new gesture recognition keyboard that has better Emoji integration and a new voice recognition system that allows you to access Google Now by saying, “OK Google” when you’re in the home screen.